A while ago I did a poll on IG stories asking what types of content you’d like to see on my site. 95% of the people who voted wanted more lifestyle content. I also received a few direct messages from readers with specific things that they wanted to see from me. Today I’m excited to speak on a topic that was recommended by one of those ladies. If you’ve been reading my blog for a while, you already know that I’m a newlywed. My husband and I just celebrated one year of marriage on the 23rd of this month. We had our first date in September of 2011 and have been together since then. What I haven’t shared a lot about however, is my time as a single woman before meeting my husband. Today I will share a little bit about that, as well as my advice to single women who desire marriage. 1. Don’t waste time entertaining men who you know aren’t marriage material. How many of you have made the terrible mistake of doing this? I know I have! Ladies, trust me when I say it’s a waste of time to date someone who is just not right for you. I do realize that it might take a few dates to discover this because you don’t learn everything about a person on date #1, but once you realize it, happily move on. Oftentimes we even know before a date occurs if a certain guy is the type of man God desires for us. For that, we have to thank God who gives us the spirit of discernment, our women’s intuition and the internet and social media platforms we can use to ‘research’ men of interest. If you’re feeling lonely in your season of singleness, pray and ask God to help you fill that void with something positive. Never feel like you have to have a man in order to do some of the things you want to do. Go shopping with the girls, go to a movie with your family, or even take yourself out to dinner. I have done all of those things many times! I used to always think it was stupid when I’d hear women saying that they call guys up for certain things; one guy to take them to dinner, one to pay for a movie, and one to buy them something from the mall. Knowing good and well those guys weren’t good men for various reasons. I believe doing those types of things is a waste of time and only keeps you further away from the blessings God has for you. If He can’t trust you to be joyfully content in your singleness, do you think He is going to be in a hurry to give you a husband? Don’t sell yourself short. You can do all of those fun things for yourself and if necessary, by yourself until the right one comes along! So I say all that to say, trust your instinct when it comes to dating and enjoy your season of singleness. While you’re out and about living your best life, avoiding men who aren’t marriage material, your potential husband will likely pop up at the most random, yet perfect time. I know mine did, and I’m thankful for it! 2. Work on becoming your best self while building your self-confidence. While everyday is the perfect day to work on becoming your best self (married or single), when you aren’t in a marriage, you most likely have more time to focus solely on you. Get physically fit! Join a gym, go walking, take a dance class, or even hire a personal trainer. I worked out much more when I was single than now (although that’s about to change soon). I remember at one point when I was single, I was teaching my karate class twice a week, taking a dance class on Saturdays and going to the gym about 4 times a week. I was in the best shape I’ve ever been in, despite having knee injuries. My diet wasn’t too bad either. In addition to working on improving your physical health, I’d also recommend working on your mental health. This can include taking time to meditate each day, joining a bible study group or even seeing a counselor/therapist to assist with whatever you may be dealing with. When you’re in a good space mentally and physically, you open up the door to be a blessing and receive blessings; one in which could be your potential spouse! Another way to work on becoming your best self is to get your finances in order. I know many people may not be in the best space financially for a number of reasons. It’s important to get educated when it comes to finances. Do your research, read a book about finances or even meet with a financial advisor to learn about how you can master your finances and eliminate things that may not be a necessity. For me, after finishing graduate school, a job was hard to come by when the market crashed in 2008. Although I was fortunate to not have any student loan debt from undergrad or grad, I didn’t have any money because I hadn’t landed a job in my field yet. I made the decision to move back home with my parents until the right opportunity came along and I was able to get on my feet. I lived there for what seemed like a lifetime until I landed a part-time job in my field. Still, after getting the job, I stayed there longer to save up. Eventually, in one year, I managed to save $10,000 working part time in education (which doesn’t pay a lot at all). I could not have done that had I immediately tried to move out after landing the job. Shortly after, I was able to purchase my first home. Doing what I did may not work for you, but I would advise you to do what’s best for you to ensure you’re in a good place financially. Working to improve yourself in various ways not only prepares you for the life you desire, it also helps to build up your self-confidence. During my season of singleness, I read many books. 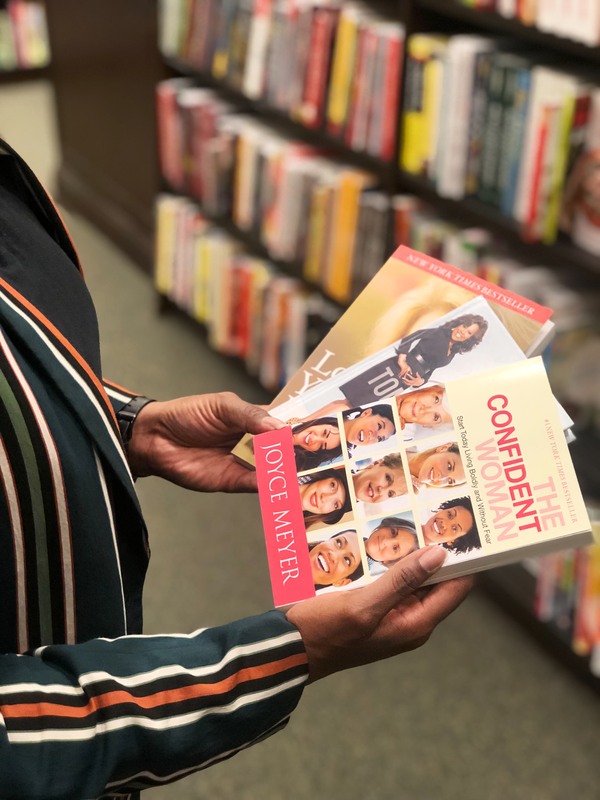 One of the books that stood out the most was “The Confident Woman” by Joyce Meyer. “The Confident Woman” encourages you to live boldly and without fear. I highly recommend reading this book if you haven’t already. 3. Live your best life and treat yourself. Of course you should live your best life whether you’re single or married, but your singleness is a time where you don’t have to answer to anybody; enjoy it! You are free to do whatever you want, when you want. If you can afford to, travel! Travel to other countries, other states and even different cities in the state you live in. It’s always fun to explore, learn about other areas and see God’s many creations. If you’ve been thinking about starting a business, go for it! Any type of goal or aspiration you have, go after it full force! You have the time and resources. Research, plan, pray and get to work! It’s also a good idea to treat yourself to something fancy, something that you wouldn’t ordinarily buy or do on a regular basis. For some, that might be purchasing a year-long spa membership or buying a nice luxury handbag. If it’s in your budget, treat yourself every now and then. Once you get married, large purchases like $1500 handbags will most likely need to be discussed with your spouse. 4. Don’t be jealous or envious of married women, learn from them. 5. Put yourself in places where quality men hangout. If you hardly ever go out, it’s going to be quite difficult for you to meet guys and to be pursued by them. You don’t have to go clubbing every week or anything crazy, but attending networking events, festivals, or even going to places like Lowes and Home Depot puts you in the path to meet men. You may not find quality men at all these places, but as you meet more men, you quickly weed out the rotten apples. Even going to a friends’ birthday party can give you an opportunity to meet guys. That’s exactly how I met my husband, at a mutual friends birthday dinner. Now if you’re shy, quiet and somewhat introverted like me, you’re going to really have to push through to be more open to conversing with guys. Fortunately in my situation, I didn’t have to try to spark up conversation too often since my husband is outgoing and he beat me to it. He was very persistent and took the lead in terms of pursuing and courting me, as a strong masculine male should do. If you’re shy and/or quiet, pray and ask God to increase your confidence and boldness. When it comes down to it, there are many places you can meet quality men, but it’s often hit or miss. Determine what you’ll do, and trust God to handle the rest. If you’re a single woman in waiting, I hope this post was helpful for you in some way. I pray that sharing my advice and experiences will inspire you to enjoy your season of singleness as you wait for God to give you your hearts desire! In the comments below, share your thoughts about this post and/or any advice you may have for women in waiting! Thank you! I think it’s very normal to have that excited, yet scared feeling. It’s natural because when things are new, you’re still getting to know the person and it can sometimes take a while before you know if this person is someone you can date or see yourself with long term. My advice would be to enjoy your time together while listening to your intuition. You’ll know if something isn’t right. Let me know how things go. All the best!